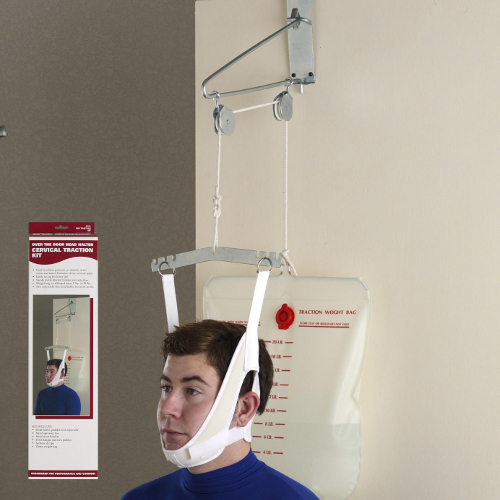 The SAI / OTC Over Door Head Halter Cervical Traction Kit includes head halter, padded and adjustable; metal spreader bar; metal door bracket; door hanger and two pulleys; section of rope; and water weight bag. The SAI / OTC Over Door Head Halter Cervical Traction Kit is used to relieve pressure on muscle, nerve tissue and minor fractures of the cervical spine. It is easily set up for home use. The sturdy metal bracket fastens over any door, and the weight bag is calibrated from 2 lbs. to 20 lbs. ; easy to fill with ordinary tap water. Kit Includes: Head halter, padded and adjustable; metal spreader bar; metal door bracket; door hanger and two pulleys; section of rope; water weight bag.